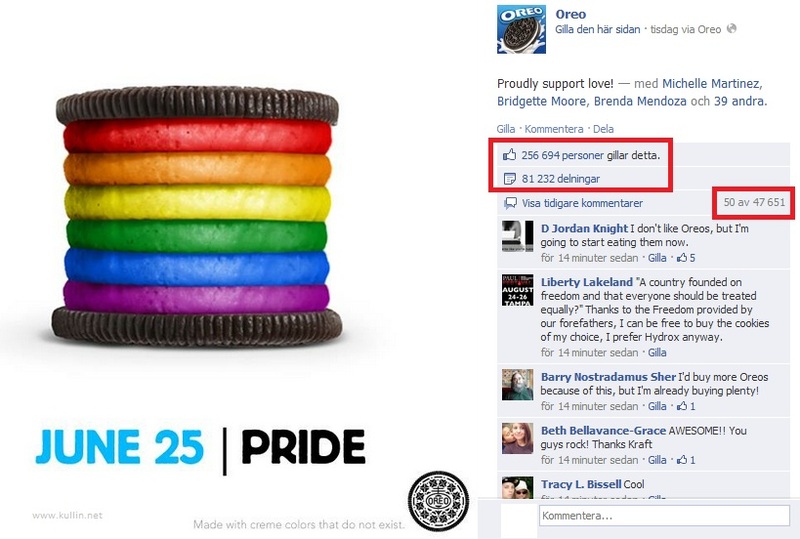 In celebration of LGBT Pride Month, Nabisco owned cookie brand Oreo posted an image of a rainbow coloured cookie on its Facebook page earlier this week, with the caption “Proudly support love!”. An incredibly simple, but yet smart move to generate a lot of buzz. The image has currently generated 256,000 likes, 47,000 comments and 81,000 shares. The image was also tweeted and has been retweeted 3,100 times at the moment. Of course, this is a calculated move by Oreo and they are certainly aware that the image will stir up some controversy. Some media reports are talking about boycotts against Oreo, but that news angle seems grossly exaggerated. In fact, most comments seem to be supportive, so digging up a few negative comments just seems sensationalist on the part of the traditional media. A few boycott pages have been launched on Facebook but they have about 20-30 likes, so in comparison with the quarter of a million likes and more than 80,000 shares, it is nothing. It is a bold move and by the looks of it, Oreo is getting deserved praise for it.